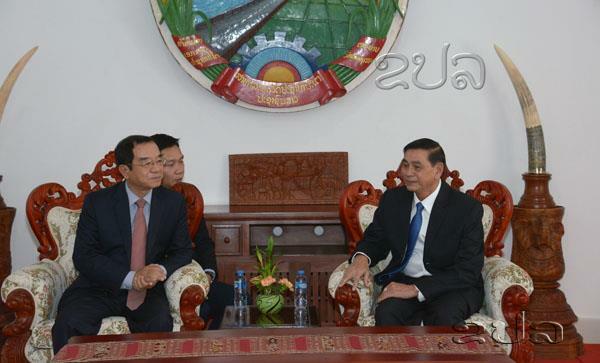 (KPL) Minister and Head of the Presidential Office, Mr Khammeung Phongthady received the Head of the Presidential Office of Vietnam Dao Viet Trung on April 4, as the latter and his entourage are on a working visit to Laos on April 4-7. In bilateral talks, the host and guest informed each other of the socio-economic development as well as their secretariat practices for leaders in their respective countries. Both sides also exchanged lessons in various areas falling under the responsibilities of the presidential offices ​so that they can be applied by relevant officials of both offices. This year marks the 55th founding anniversary of diplomatic ties and the 40th anniversary of the signing of the Treaty of Amity and Cooperation between Laos and Vietnam. To celebrate the historic day, a variety of activities have been planned at both central and local levels in the two countries.